EXCLUSIVE: Yucaipa High School’s Hall of Fame Baseball Coach Opens Up On His Decision To Retire. YUCAIPA, Calif. — Jeff Stout always said it was the little kid in him that motivated his high school baseball coaching career, and he reminded his athletes that baseball is a kid’s game yet expected them to play in a professional manner. Stout officially retired this season after 41 years at the helm of Yucaipa High School, yet the folklore will remain forever. He finishes with a 809-348 record, putting him 5th on California’s all-time high school win list. There hasn’t been a season in the past 20 years when Stout didn’t have a player on a MLB roster. He’s had nine ex-Yucaipa High players in spring training camps at once and at the same time had countless others playing college baseball. Before his hiring at YHS in 1976, Stout was a two-time professional draft pick in the late 60’s, once by the Dodgers out of La Puente High and again by the Kansas City Royals out of Mount San Antonio College. He advanced to Double-A as a good hitter and fielder who could play any position except pitcher. Stout never got to Triple-A because KC had a log jam of all-stars in front him. Although never making it to the Majors, Stout learned what it took to get there. Four years ago he had six Yucaipa grads in the Majors at one time. He’s coached 24 players who have been drafted professionally and twice that number who were good enough. Overall, he probably coached over 600 players and can rattle of the names of everyone of them. About 160 of his alumni played baseball in college. If you made Stout’s 25-player roster, you eventually would get a chance. Often in an unexpected role. If you were a starting catcher you could end up on the mound as a closer. If you were a starting pitcher you could end up as a starting catcher. For a man who was said to a strict traditionalist, innovations were the norm under Stout. If a pitcher couldn’t blow the fastball by hitters, Stout wouldn’t cut him, he’d convert him, often into a submarine-style reliever. One of the remarkable examples of his experiments came in a 2003 playoff game against highly ranked Riverside Poly. About 20 scouts were attending equipped with radar guns to evaluate Poly’s Jo Jo Reyes. Within three innings Yucaipa scored eight runs and sent Reyes to the bench. Likewise, Poly knocked out Yucaipa’s starter. Stout and former pitching coach Andy Calbreath then motioned for centerfielder Daniel Lunt to take the mound. A few games earlier, they noticed when Lunt was throwing the ball it created an odd rotation. The scouts who came to see the Reyes’ 95 mph fastball, left in a hurry after clocking Lunt’s fluttering 60 mph oddball pitch. Lunt earned the win. Reyes took the loss. Reyes went on to pitch six years in MLB. Taijuan Walker, Matt Davidson, Matt Carson, Corky Miller, Scott Snodgress, and Mark Teahen all have stories that add to the Stout lore. Before Walker became Taijuan Walker the big league pitcher, he thought he was good enough to play in the NBA. Maybe so. But Stout and Calbreath thought he had MLB stuff. Miller was a prep football star who Stout prodded on to a 17-year career as a pro baseball catcher. Snodgress was another basketball player who Stout used when he was 14-years-old as the starting pitcher in a CIF-ttile game at Dodger Stadium. Carson was a water polo player when Stout directed him onto a 14-year pro baseball career. Davidson, a current Chicago White Sox, was a star YHS freshman quarterback who was convinced by Stout to concentrate on baseball. Teahen was a little skinny kid at Yucaipa HS who progressed to the brink of MLB super stardom. “Stout established a tradition in the community where kids in little league were already thinking about the chance to play for him at Yucaipa High School. I did, too,” says Shawn Macias, who played and later coached for Stout. Macias was a member of the first of three CIF-championship teams coached by Stout. Macias said Stout never thinks he knows everything and is always trying to find a new way to succeed. Macias agreed that Stout set rules that had to be followed. “He was tough on us. That’s what made us tough as a team.” Macias said it was special that both he and his son’s Tristen and Jordan all played at YHS for Stout. Macias said Stout made the playoffs 39 times and won 19 league titles. Michael Carpentier and Julian Alvarez both said they transferred from Citrus Valley to YHS this year for a chance to play for Stout. “He’s a legend,” said Carpentier. Alvarez adding, “We’ve learned things that we can take with us forever.” Stout taught business skills as well. A few years ago, his players sold 10,000 dented cans of dog food to raise money to play in an out of state tournament. Stout admitted it could be difficult when it came to personnel decisions. “Just because someone’s mom always brought punch and cookies doesn’t get someone playing time.” Those close to him said his decision’s were always based on what was best for the team. One of Stout’s landmark decisions came when he benched his own son, Steve because another first baseman could hit better. 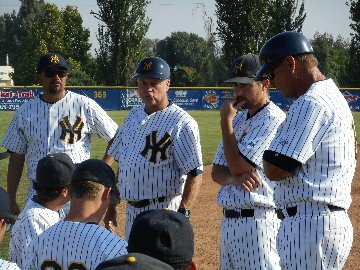 Yucaipa HS baseball coaches flank Jeff Stout (far right) during final post-game meeting of his career. From left assistant coaches Shawn Macias, Tom Shelby, Alex Espinoza and Stout.